The selection of a final memorial takes time. We offer one of the area’s largest selections of monuments, markers, and private mausoleums. 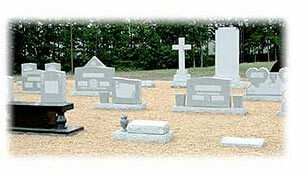 We have an onsite display area which will help you determine what style and size of memorial is best for you. We offer a variety of granite colors. Our bronze memorials and private crypts are of the finest quality and are priced far below what most memorial parks sell them for. Our directors have years of experience in assisting families with this decision. Unlike sales based-organizations, our directors receive no commission for working with you.